You are here: Home / Blog / Uncategorized / Testimonial from a long time patient of Cancun Cosmetic Dentistry! Here we have an amazing video from one of the patients that came to us many years ago. 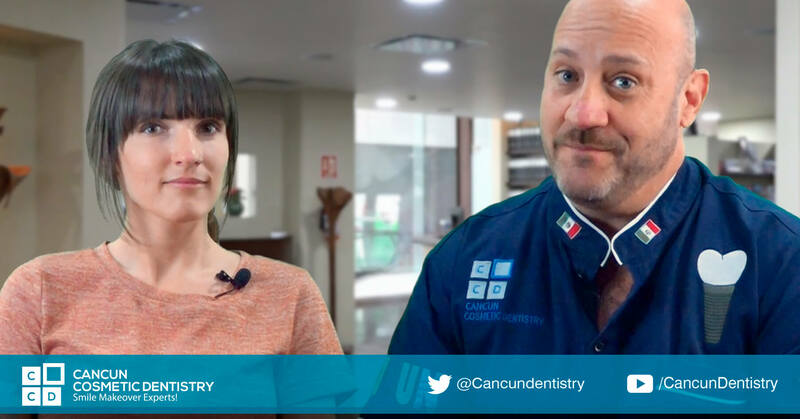 These types of patients have returned every year during their vacations for checkups or to get more work done… even bringing family and friends along so they can also get affordable dental care and cosmetic dentistry in Cancun! We feel like we have made new friends and our family grows every time this happens! It’s so amazing to have them here. Seven years ago I had someone who came visit me for a big change and it was a full mouth make over and it was a complex thing, because I have a young girl , beautiful all the teeth and here is with me after 7 years, Ivonne, how are you? I’m doing great, thank you, how are you? All the way from Alberta. Big hugs to our friends in Alberta. Tell me a little what has been happening in all this seven years that you have been with those beautiful teeth. Well, I… it’s been great, I had no problems, no concerns but I also take care them. Yes! That’s important! Service. They come, they do full mouth makes over and they don’t care of their teeth, well, guess what is gonna happened? But when you get good care of them… this is the story. Yes, so I go twice… twice a year to get cleanings which helps, which is great but yeah always get a compliments all the time and confidence and yeah like I said always getting compliments here like everywhere I go, which is always nice so helps with good confidence, so yeah, great, I’m really happy, I wouldn’t change them. I wanna ask you a complex question, no dental, a separate thing, have you seen anything in Cancun about been not safe or like a… because you can find in the media that they say that oh don’t travel because Mexico, Cancun and all that… mostly Cancun. Have you seen anything in those ten years? No, I haven’t, that’s why I’ve been here like ten times, I always come back and I feel absolutely safe and I take the bus everywhere on my own and that has never been a problem. Canadians do love Mexico, that’s why I’m always here. The food, the experience, all that…. Cancun has a lot of things, so that’s why I thank you for sharing and I wanna thank you also been part of this big family of life changing stories and when I have patients that they have really good care of their teeth that makes a big difference. And whatever you need, whatever you need please don’t hesitate, we’re family and whatever you you need just come visit and I will fix it up. I wanna tell everyone that if you have anything to do, like a full mouth make over you can go anywhere but there is a lot of Canadians traveling here… and that’s one the stories that can happen. Thank you every one for watching, I’m Doctor Arzate and give us your likes in our social media. Big hugs Canada! Celebrate New Year 2019 in Sunny Cancun! A big change with All-on-4 dental implants in Cancun!